In Queenstown, there are endless possibilities for 'what you should do'. Especially during the summer, the entertainment sector, companies are competing against each other. I forgot to mention earlier about how beautiful it is in Queenstown. The water is crystal blue, and you know the lake has good water, when it is clear and you can see the bottom with the rocks. The pine trees on the mountain are my favourite. It reminds me of Lake Tahoe. And it looks like what I've seen in those typical American movies, where families go for a holiday or for camp near the lake (Parent trap and Cheaper by the dozen). Picturesque! Horse riding is my personal highlight of the trip! We went twice, and we really did love it. I really loved the first time, but I even loved it even better the second time in Te Anau, which I will be posting about later. My mum decided to stay at the hotel. We went to Moonlight stables, near Arrowtown. We were taught how to control the horses, so how to go forward (kick them in the belly), turn right and stop. I rode on a horse called Sayla (not sure of the spelling) and he was pretty comfortable to ride on. Not too tall, and behaved. Except when it wouldn't stop eating grass. We even got to canter (seriously scary) and trot. It was really scary at first, and you're holding on for your dear life. But it's fun! We got to do it a few times. Yii-May described her horse as 'temperamental', as it specifically didn't like one of the white horses. I find horses amusing, how some of them have attitude and how there's one particular bossy horse that has to be leader. We saw a lot of deer, so pretty! Except, at that time, they had their antlers off. My dad really liked horse riding, and look he's a Malaysian cowboy in New Zealand! I really wish I could do horse riding as a hobby. I would really recommend going horse riding in New Zealand. I might even say that it's a must-do. There are many trails in Queenstown, which is really convenient. I only went on one though, for a few runs, walks and also cycling. I did the Frankton trail, and that is a track along the lake, and you can reach to town. It's quite a good track, not difficult at all. I did that whole two-person bike thing with my dad, which was way too much fun! It isn't as easy as it looks though, especially at the start. And it's still a pain to go up hill, even though you have two people cycling. We went on the Thunder jet (there are also other companies like Shotover jet), and it was quite a whirl. We got extremely wet after doing so many 360 turns!! It's quite nice jet boating around Queenstown. My only complain about this is that we kept on stopping after turns, to have the person talk about the mountains or the water system, I would've loved to just keep on going straight and back. 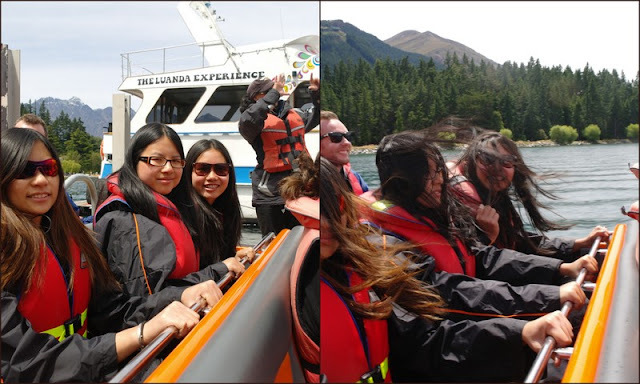 OH and in my previous post for the Queenstown eateries, we ate fish and chips before, and literally went jet boating 5 minutes afterwards. My dad and my eldest sister didn't feel too good. Did you know Lord of the rings was filmed in New Zealand? Surely, you do. My sisters were quite interested, since they've watched all the Lord of the rings movies. So we had a guide take us to different places, where they shot the scenes for the previous Lord of the rings movies. It was quite an educational tour, as we learned the different tricks there are in Hollywood movies. Smart man, Peter Jackson. We drove up to Glenorchy, a really small town. This is the library. My family and I were hilariously laughing. Sorry if I offend any New Zealanders. Okay, so honestly, the Lord of the rings tour was a bit of a disappointment. I think expectations were too high, and there was more driving than actually getting out. I don't think it was worth the money either, it was quite a bit. We also wanted to go kayaking on our last full day, but the waves were too strong. It would be really nice to go kayaking on the lake though, so if you do have a chance, you really should go! Especially when the weather is good. Other things I would recommend to do: bungee jumping (not unless you're a coward like me), skydiving, other boat things like those big water bikes, ziptrek tours, going up on the Skyline gondola, and going down by luge!